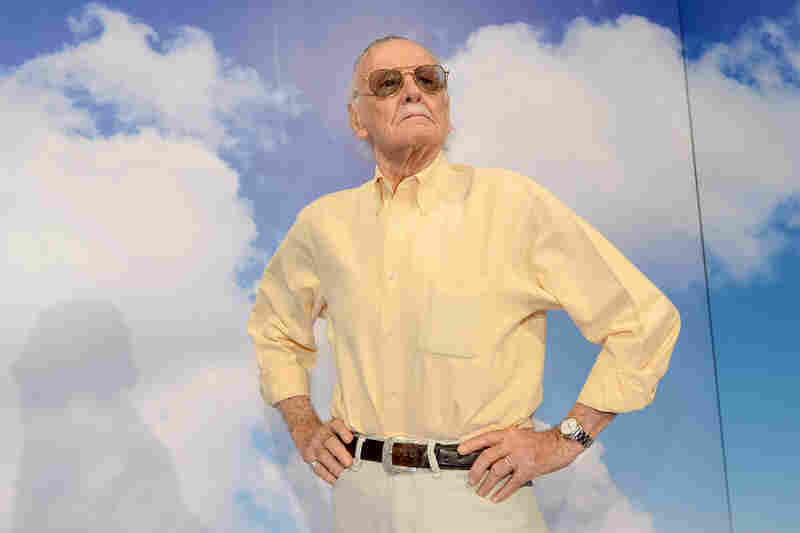 Marvel Comics' Stan Lee Dies At 95 Lee gave us over six decades' worth of superheroes we could identify with, characters like Spider-Man and The Incredible Hulk, who reacted to superpowered crises in believably flawed, human ways. Comic book legend Stan Lee poses at the opening reception for "Stan Lee: A Retrospective" presented by the Museum of Comic and Cartoon Art on Feb. 23, 2007, in New York City. 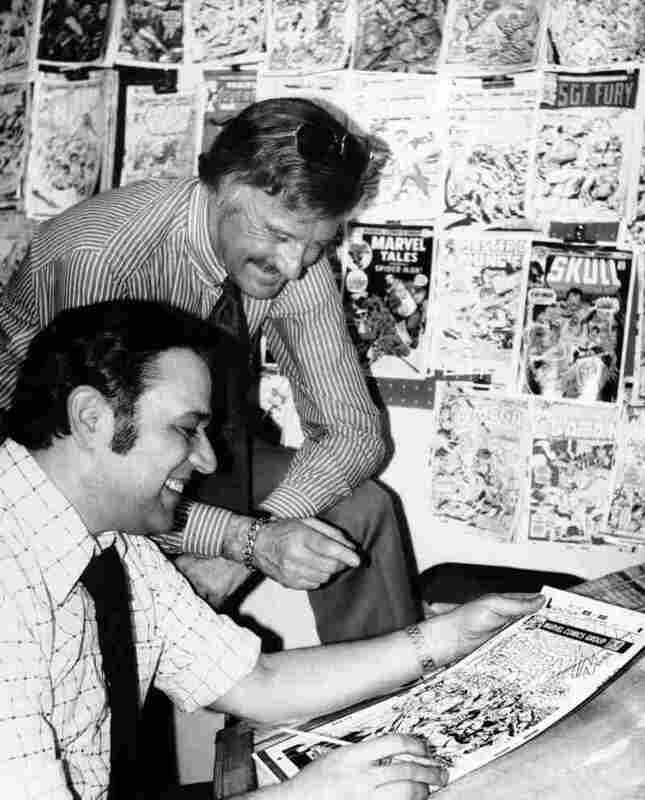 Lee (standing), publisher of Marvel Comics, discusses a Spiderman comic book cover with artist John Romita at Marvel headquarters in New York in 1976. 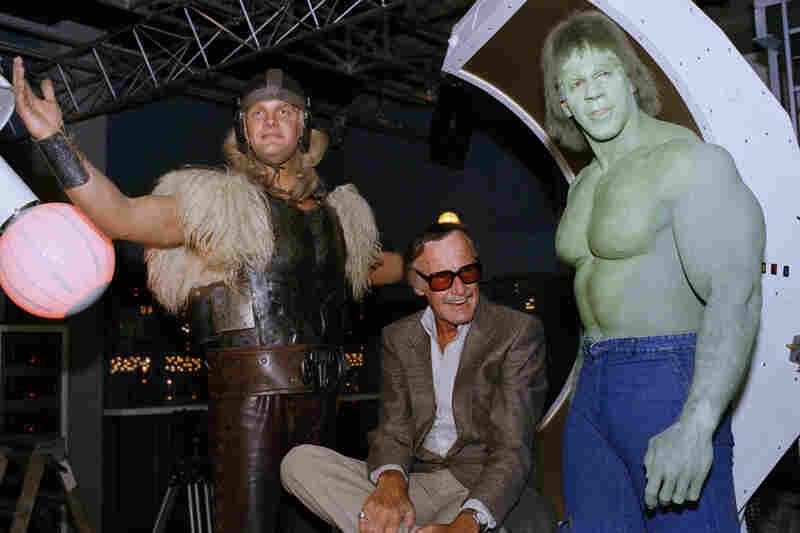 Lee (center) poses with Lou Ferrigno (right) as The Incredible Hulk and Eric Kramer (left) as Thor, in a special movie for NBC, May 9, 1988, in Los Angeles. Lee said the secret to successfully transferring comic book characters to television is to avoid making a carbon copy. 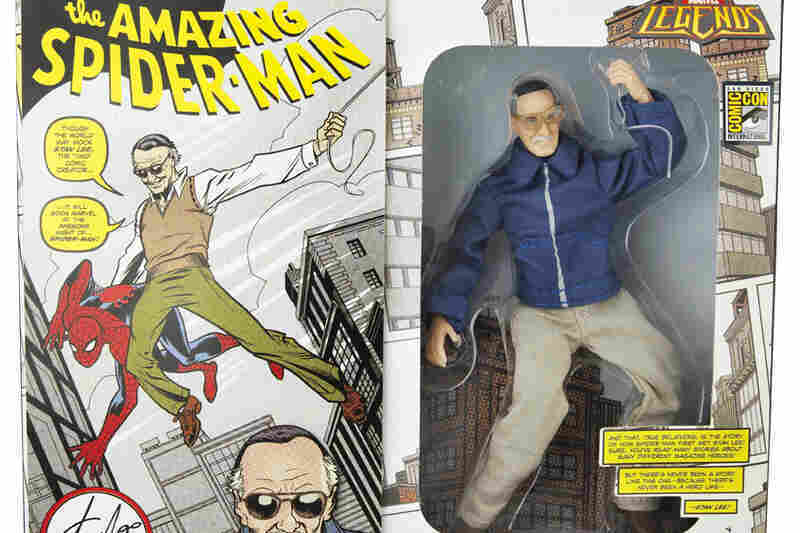 Hasbro pays plastic tribute to Lee, the then-84-year-old creator of Spider-Man, the Hulk, X-Men, Fantastic Four and other comic book heroes, by interpreting him as a 6-inch-tall Marvel Legends action figure. Former President George W. Bush congratulates Lee, founder of POW! Entertainment, after presenting him with the 2008 National Medal of Arts on Nov. 17, 2008, at the White House. 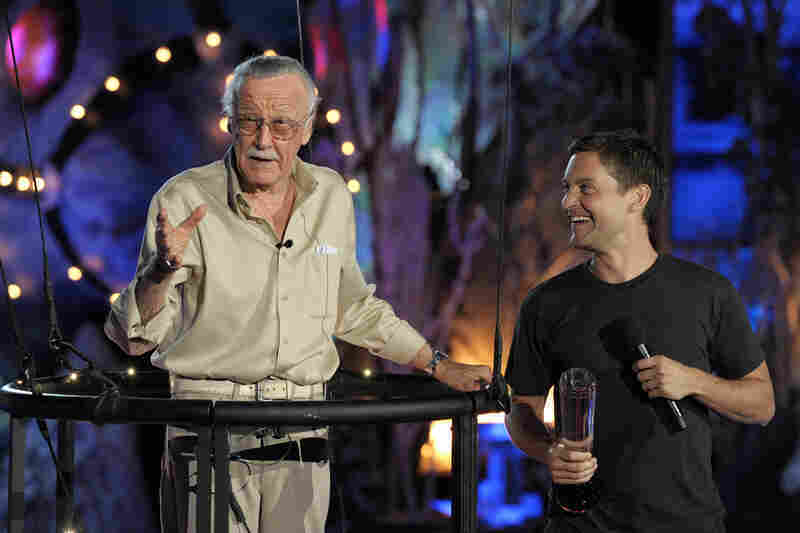 Lee accepts the Comic-Con Icon award onstage from actor Tobey Maguire during Spike TV's Scream 2009 held at the Greek Theatre on Oct. 17, 2009, in Los Angeles. Lee gives his wife, Joan, a kiss after he received a star on the Hollywood Walk of Fame, Jan. 4, 2011. Joan Lee died in 2017. Lee at Comic-Con in San Diego on July 19, 2013. "He would talk about prejudice, racism," Scott says. "I mean the X-Men, here was a group of people who were only trying to do good things and only trying to help and they were constantly ostracized by being mutants." "The person viewing the cartoon or reading the book should have something to think about, not just look at mindless pages of running around," Lee said. "That was the revolution that Stan Lee did," says David Goyer, who adapted the Marvel character Blade for the screen. "He was the first one to create, with Spider-Man, superheroes who doubted themselves, who were tormented, who were unhappy." The increased complexity of Marvel's characters broadened their appeal to older audiences. 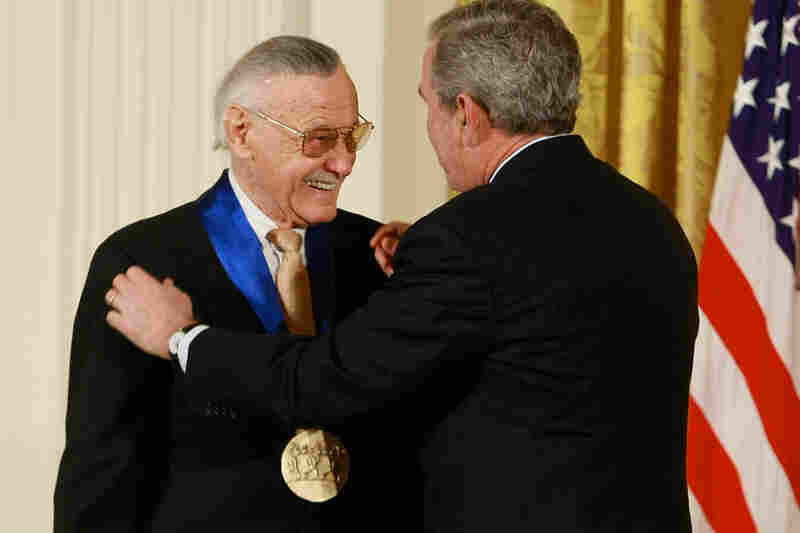 Lee, always a savvy businessman, spearheaded the expansion of Marvel Comics from a division within a publishing house to a large multimedia corporation. 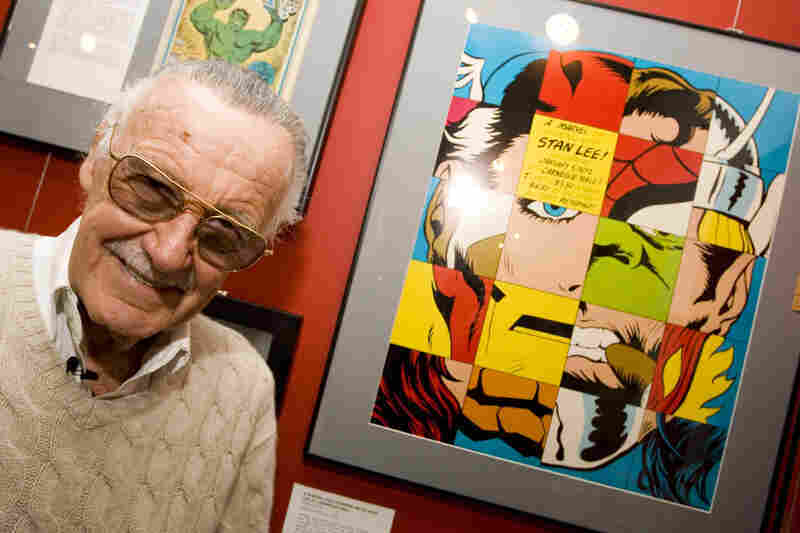 Lee's larger vision was to create a shared Marvel universe in which characters from one series would cross over into another. He cited one example at a 2008 fan convention: "There was one I loved, I think it was the Fantastic Four, and they were at a ballgame at Yankee Stadium and there were a lot of press photographers there. So I told [comic book artist] Jack Kirby to draw Peter Parker in the background with a camera. And we made no mention of it, he was just in the panel, and we got about a million letters saying, 'We saw Peter Parker at the game. That's terrific.' And it made it seem like these were real characters who live in the same world and occasionally they get together. And that was something I got a big kick out of." Lee built a sense of community between fans and creators. He engaged readers through his column, Stan's Soapbox, and often signed off his letters to fans with the catchphrase " 'Nuff said." And he became as recognizable as his superheroes through his many cameos on TV and in movies.